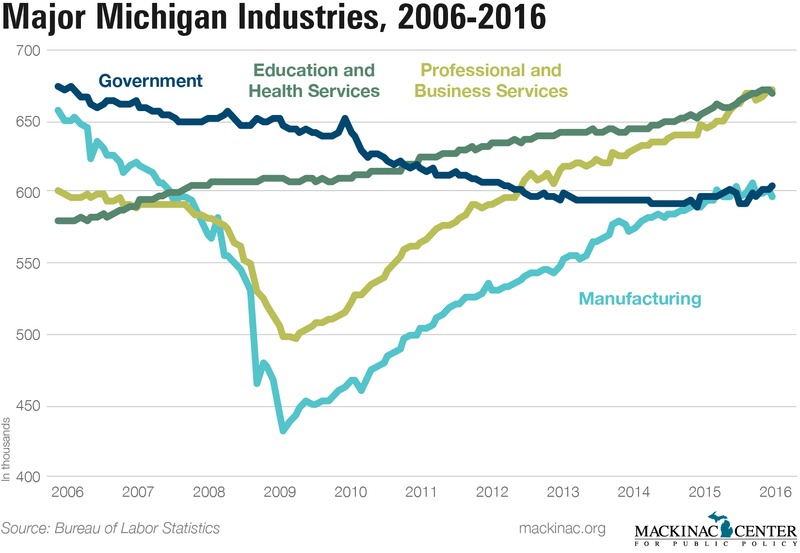 In 2006, Michigan’s leading industries were in government, with 672,800 jobs, and manufacturing, with 657,000. In that year, business and professional services accounted for 601,900 jobs, while education and health services accounted for another 580,600. A decade later, two sectors — business and professional services, and education and health services — both outnumber government and manufacturing jobs. As of November 2016, business and professional services led all sectors with 671,400 jobs, followed by education and health services with 667,900 jobs. The government sector is down to 606,300 jobs, while manufacturing is the lowest of the four major sectors with 596,600 jobs. Manufacturing's biggest hit came during the 2008 recession when automotive companies began hemorrhaging jobs and the U.S. government bailed out General Motors and Chrysler. In June 2009, manufacturing jobs slumped to 432,900, the lowest point since 2006. Business and professional services also took a hit during the recession, but that sector has since surpassed all others in the state. Total non-farming jobs in Michigan numbered 4,369,600 jobs in 2006, down to 4,359,500 jobs as of November 2016.